Brand new 35,000 sq. 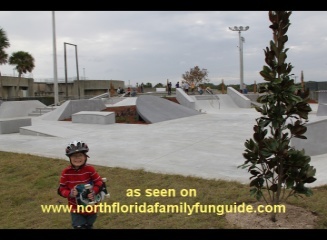 ft. $800,000 skatepark in Daytona Beach, Florida! This facility has an interesting collection of obstacles and challenges, from eggshell coves, ramps, rails, stairs, angles, and a large kidney shaped bowl to test your skills. Skateboarders and BMX bikes are welcome here at this park. Covered picnic area with many picnic tables and a large grill big enough to comfortably handle a large event. Restroom facilities, and a drinking fountain. Park visitors under 18 are required to sign a waiver also signed by their parents before skating. Daytona Beach employees were there when we arrived with forms to fill out. Bryan really enjoyed this busy skateboard park! The big guys were very generous and kind and gave us lots of room, while Bryan enjoyed riding down the hills on his oversized skateboard. He had a blast!